The cherry trees in California are sitting dormant now, but they will be waking up soon, for what the industry hopes to be a better season than the last few years. “Cherry trees will soon push bud and leaf out and produce a crop by late April. We've had, I think, a decent amount of what we call chill portions,” said Nick Matteis, a spokesperson for the California Cherry Board. 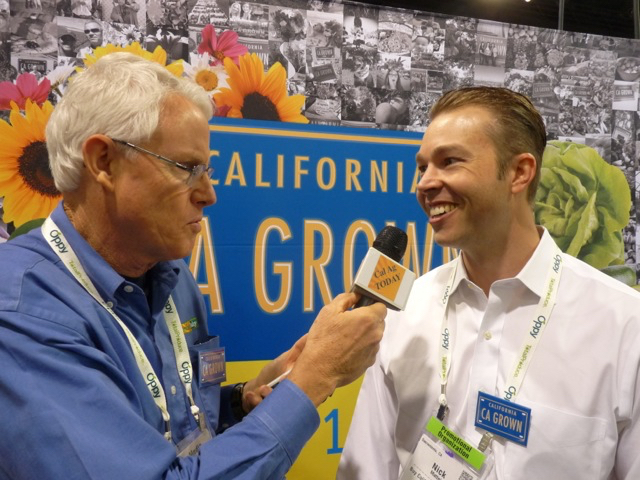 California Ag Today's Farm News Director Patrick Cavanaugh, left, speaks to Nick Matteis. Enough minimum temperatures will help the trees become more vigorous in the spring. “It's one of the things that makes growing cherries particularly challenging in this state,” Matteis said. “By January, folks will know, and hence, based on that information, that's when the rest-breaking materials are sprayed if needed.” Rest-breaking sprays are used to compact and advance bloom and harvest in cherries. Many consumers in California really hope that this upcoming season will be a good season for cherries. “The only thing that makes it worthwhile is that people still just love to have those cherries at the earliest chance possible,” Matteis said. “Last year, we got rain at the wrong time. Then we had a lot of split cherries that just didn't make it to the market. The year before that, anybody's guess is as good as anybody else's,” Matteis said. The cherry growers this year need a break. The state of California did not have a very good crop set two years ago, though last year, they had the opposite. “That's the story with cherries, we're always trying to squeeze into a really tight window, whether it comes to growing conditions or markets,” Matteis said. There are always multiple factors that could lead to a decline in production. “There was some speculation amongst the growers that it maybe had something to do with bloom and pollination. Some thought maybe the chill was a factor, too. Of course, when you talk about any kind of factorial statistical analysis, I'm sure there are many combinations that'd be impossible to simplify,” Matteis explained.